For the first time since March, Wilson went on a tangent from their usual GOTM formula and created the Wilson Glove of the Month October as an outfield mitt. 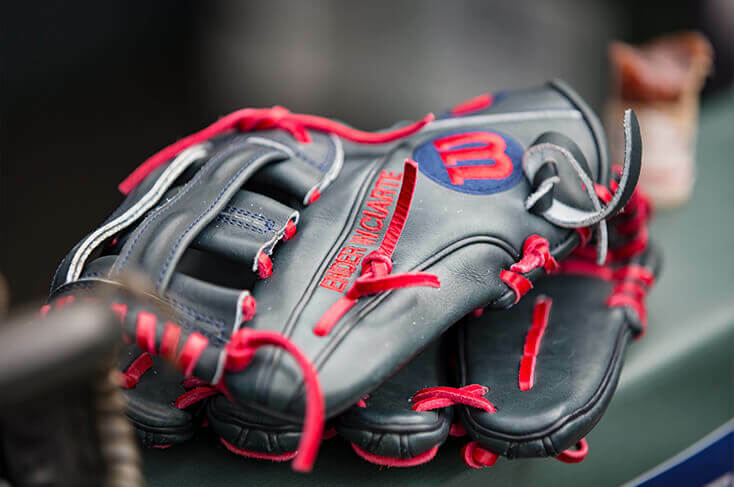 In fact, the Wilson Glove of the Month October is the Ender Inciarte game model, a 12.75-inch Wilson A2000 1799 in an Atlanta Braves’ themed navy blue and red colorway. In addition to its 12.75” length, the 1799 pattern comes with a deep pocket, flat finger design, and thumb-to-pinky squeeze. Inciarte indeed created this sweet navy and red colorway, but has shied away from using it thus far. As an A2000 model, the Wilson Glove of the Month October comes with top-notch and long-lasting materials. Note that the Wilson Glove of the Month October is not available through online retailers, only through selected brick-and-mortar store retailers. Find your local GOTM dealer. The Bottom Line: Despite its limited quantity, I see the Wilson Glove of the Month October as an excellent option for those outfielders looking for a rare bit of flash for their mitt. More on the 1799 Pattern: Generally regarded as a top-two outfield pattern, the 1799 pattern comes with a wide heel, flat pocket design that is perfect for making all types of catches in the outgrass. Has Ender Inciarte used this Glove? : Inciarte has teased us a few times about this good-looking glove, yet has stuck with the all-black mitt he has been using for the past few seasons. More on A2000 Materials: Wilson’s A2000 materials, including their rugged Pro Stock Leather, are renowned for their long-term durability. In addition, each A2000 is sturdily built in the factory with top-notch craftsmanship. Rarity of GOTM Models: Wilson only makes a few hundred Glove of the Month models and carefully distributes them to certain retailers. Find out the closest retailer to you. Love this look. Picked one up to be my next outfield gamer.